I’m not a great planner when it comes to shopping grocery’s. Sometimes I try to make a dinner schedule for the week or a part of the week. And on the basis of that schedule I try to make a shoppinglist.The first hurdle to take is making the schedule; I like almost everything when it comes to food, my dear husband doesn’t… It’s always quite a challenge to find recipes we both like or recipes I can tweak a bit so I can make two different portions; one for him and one for me. Ok, everything good so far, making the shoppinglist is a piece of cake after making the dinnerschedule.. But then we come to the second hurdle: following the schedule I made! Somehow things never go according to plan… Suddenly husband can’t be home on time for dinner but has to go straight to the training after work, I have less time then I had planned for prepping dinner or we are suddenly invited to eat with my parents-in-law.. I stopped planning too far ahead and try not to shop too much grocery’s at onces to prevent we have to throw stuff away. Don’t want to waste too much of course! Onions are a great seasoner to many dishes! I always use onions in a pasta or a curry for example. But did you know that onions are also very good for your health? They are loaded with polyfenolen, which work as anti-inflammatory agents in our body. And let’s not forget about the vitamins (mostly vitamin C) and minerals (kalium and manganese). It’s said that onions are very good for the connective tissue in our body, as well as our bone density. I added a teaspoon of kurkuma to this soup. 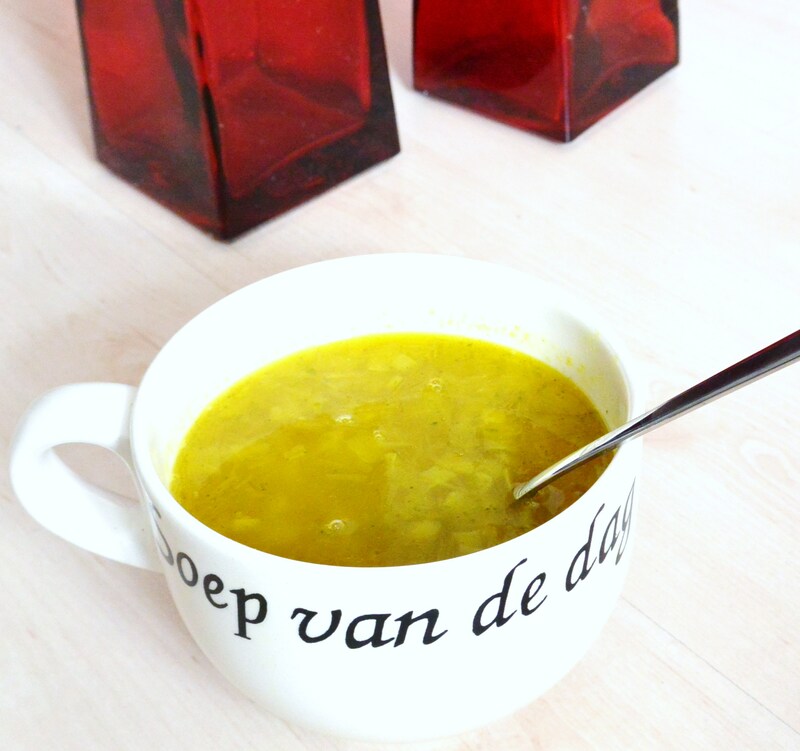 Not only gives it the soup it’s pretty yellow color, it also adds to the flavour and health benefits! Kurkuma has, just like the onion in this soup, an anti-inflammatory function and gives your immunesystem a boost! Quick and Easy Onion Soup. Chop the onions and sjalots. Heat a little oil or butter in a soup pot and fry the onions until glossy. add the peas, curry powder and kurkuma powder, stir well. After a minute, add the water and the cube of vegetable stock and bring to the boil. Boil the soup for about 10 minutes and add the himalayan salt to taste. Posted in Lunch, recipes, Soup, VeganTagged dairyfree, fit, food, glutenfree, glutenvrij, healthy, healthy lifestyle, herbs, natural, recipe, soep, soup, soyfree, sugarfree, suikervrij, vegan, vegetable, vegetables, vegetarian, veggie, veggies, zuivelvrijBookmark the permalink.